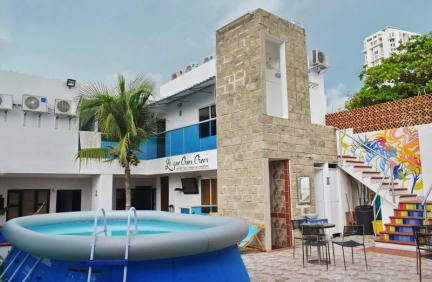 The hostel is a beautiful and comfortable two floors story house with two patios, hammocks, outdoor kitchen, bar, bb-q grill, tanning chairs and external showers. Walled city is only 15 minutes walking away. Few blocks from Berlinas and Marsol bus station, 10 minutes from the Airport. AC in every room and a Giant Inflatable pool. We are three blocks from Marbella swimmer beaches. Every bed in dorms and private rooms owns a security boxes. All room are ensuite, with private bathroom. 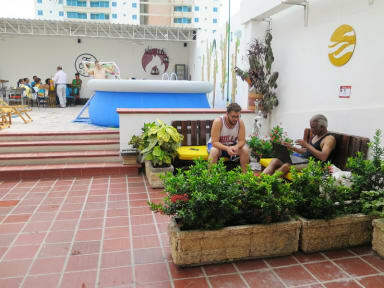 “Tu Onda” is translated either into: Your vibe, aura, essence, vibra or Flow this is why our commitment is to make sure that you have the best experience at the hostel and in Cartagena. No matter your Onda is (Fire = party, Earth = adventure, Water= Chill, Air =Culture) our super friendly staff will be happy to help you find the best activities to do and have fun though our suggested activities, tours and spots. We believe in the power of human energy and we are sure you won´t regret to explore and enjoy Cartagena staying and knowing it with us!.